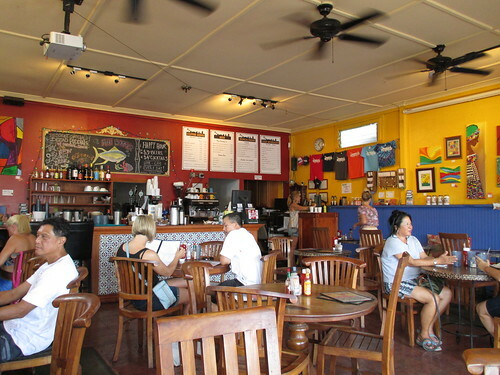 When Jamie and Olga Betham bought the Paia restaurant Picnics in 2003, they probably didn’t realize they were picking up a piece of Paia culture. 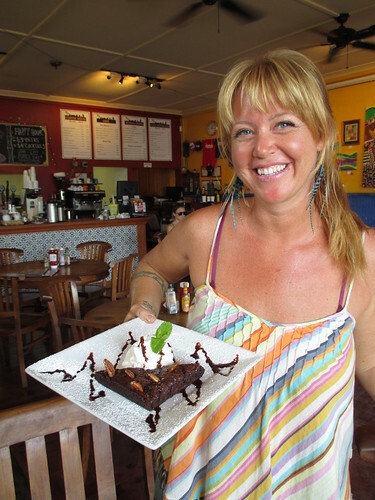 They soon learned that, and wholeheartedly embraced the idea, spending the next few years perfecting Cafe Mambo into their little corner of North Shore culinary heaven. This month, Cafe Mambo celebrates its 10th birthday by offering customers a little slice of paradise–a weekend Makena Resort giveaway. The best way to qualify is to go the restaurant for a taste of what they offer. While they no longer serve the spinach nut burgers that made Picnics such a hot spot for health nuts in the ’80s, they offer a contemporary menu with touches of Mediterranean, Spanish and American cuisine. The cafe can still pack picnic lunches for trips to Hana that you pick up and they serve from 8am to 9pm, breakfast, lunch and dinner. Their innovations extend to their dining room, which combines sophisticated European and breezy tropical aesthetic. Bench seats with pillows line one wall, and there are window seats to sit in as well. The walls are brightly painted and adorned with local art. The art hangs for three months, then new local artists get to sell their creations. The restaurant does a lot in their limited space. It’s a cozy set-up, whether you take a seat at the bar or by the window. At first Cafe Mambo didn’t offer burgers because you can find so many of them at other restaurants. But their kept playing with the recipe. Eventually, they released an organic beef burger that’s served with salsa and mayo. They also offer organic tofu, ahi, fish of the day, duck, Kalua pork and add-ons like pineapple, feta, mushrooms, bleu cheese, grilled onions, jalapenos, bacon and guac. During my most recent visit there were also offering the locally made Life Foods super-vegan, gluten- and soy-free burger. 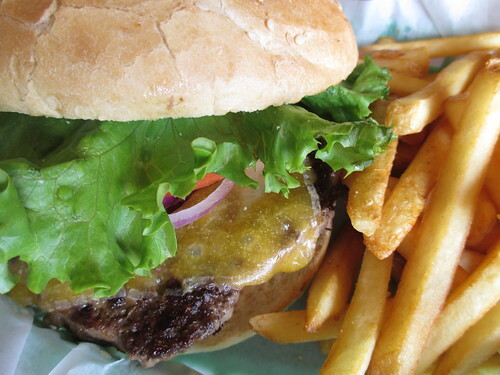 All their burgers come with fries or a salad, and are served on a bakery-made sesame seed bun with red onion, lettuce and tomato. 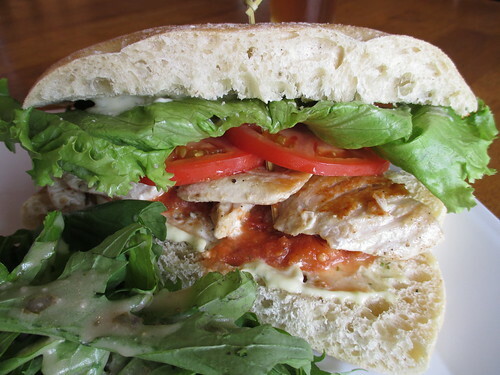 Mambo also offers a tasty list of sandwiches on Focaccia. The fish of the day is my favorite, and is served with grilled fish and tartar, but the shrimp sandwich with curry mayo, organic steak and bleu cheese, BLT and falafel are all great gourmet options, too. Their salad list offers nearly all of the same proteins as the burgers and sandwiches, and their mixed greens are perfect for gluten-free options. The fajita list offers one- and two-person options, for ultimate fajita family plates. Mambo is also known for their special couscous plates with veggie stew, Tia Concha Chicken, lamb or shrimp, if you’re looking for a hearty, warm meal. At dinner, the menu offers more tapas selections than they offer at lunch. The paella, tapas platter, onion rings with curry dip, seafood platter and Mambo nachos are just a few of the notable dishes to share and try. Breakfast starts at 8am and they offer a sensational menu of burritos and quesadillas, made-to-order omelets, breakfast sandwiches on ciabatta, croissants and bagels. American breakfasts with pancakes, waffles, eggs and toast are also represented, and they have smoothies and espresso drinks, too. All that is great, but once you’ve tried the duck, it’s really hard to order other dishes. They have a special preparation that Olga says is labor intensive but worth it because they’ve created a lot of duck fans out there. The meat is roasted until it’s very tender and they pick it off the bone so all you get is perfectly seasoned, shredded, crispy duck meat. They serve that in every prep on the menu to make it that much more tempting. 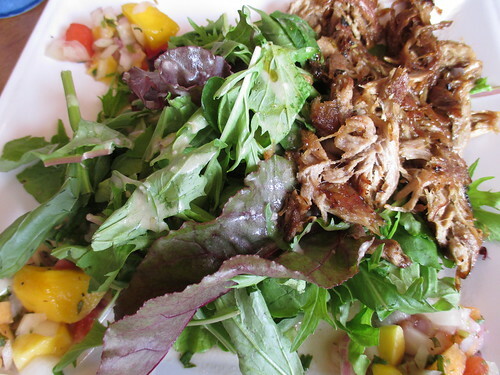 Duck salad, burger, fajita, nachos–you name it, they can make it with their duck. Olga says she’s working on a cookbook for Cafe Mambo just because of the numerous requests for the duck recipes. All Cafe Mambo’s food is hearty but healthy. Part of their success has been appealing to the water and wind athletes that visit and populate the North Shore. Their menu and style is growing–indeed, four years ago they opened on the East Coast with the Westhampton Cafe Mambo. They have plans to open other locations on Oahu, California and Hood River in the future.